‘Svelte’ is not a word that sits comfortably in the BMW design language. These days, the machines that roll out of BMW Motorradwerk in Berlin are best described as imposing—or in the case of the sportbikes, angular. It wasn’t always that way, though. The R65 of the early 1980s had a compact frame, and it’s that slender underpinning that defines this elegant new custom from Spain. 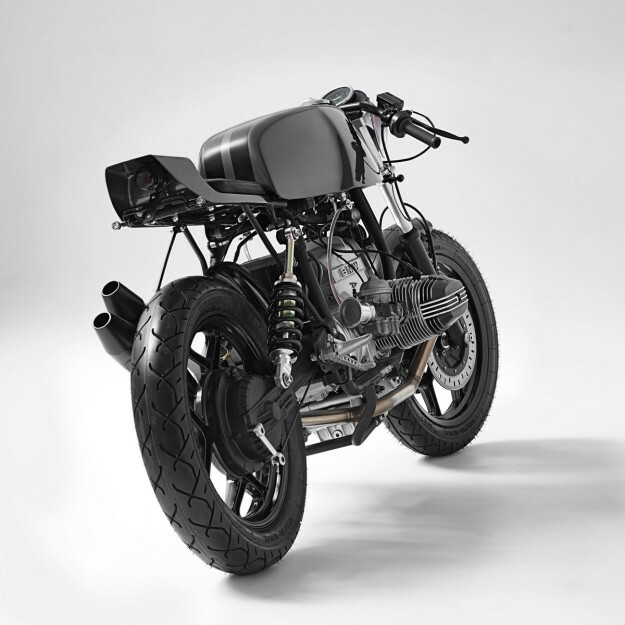 It’s the work of Karles Vives of Barcelona-based Fuel Motorcycles. He’s the man responsible for Scram Africa, an epic ride across the North African desert, and best known for his neo-retro trail bikes and scramblers (like this R100 RT). 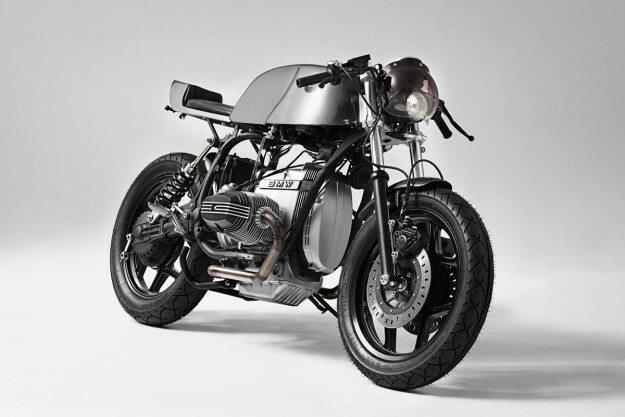 This BMW R65 is a spectacular departure from the usual Fuel style. The client—a young guy who also lives and works in Barcelona—was happy to give Karles and his team carte blanche on the project. The donor bike—a 1986-model R65 Monolever—was in good nick, negating the need for any engine work. Fuel merely removed the airbox and fitted a pair of velocity stacks. With the airbox gone, the choke had to be relocated: it now sits on top of the right carb. New headers were then made up to re-route the mufflers to the same side. Karl says the twin reverse cone mufflers not only have a racing look to them, but make the right noise as well. A small Odyssey battery has been installed too, and the wiring edited. The front forks were upgraded with progressive springs, while the rear shock was swapped out for a burlier unit from Ikon. The tires are Heidenau K65s—chosen for their vintage look and on-road performance. 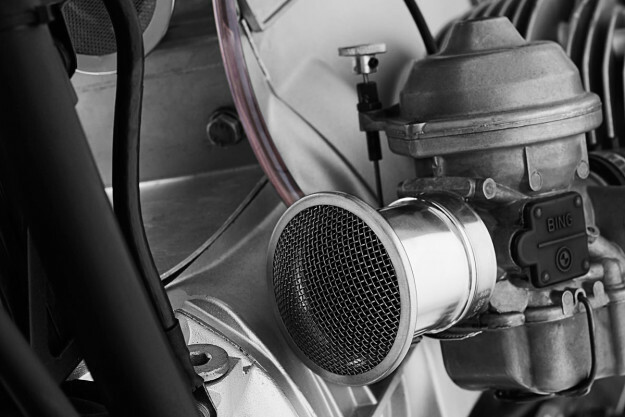 Braking improvements include a new master cylinder and hoses. For the bodywork, Fuel sourced and fitted a Laverda 750 SFC fuel tank. 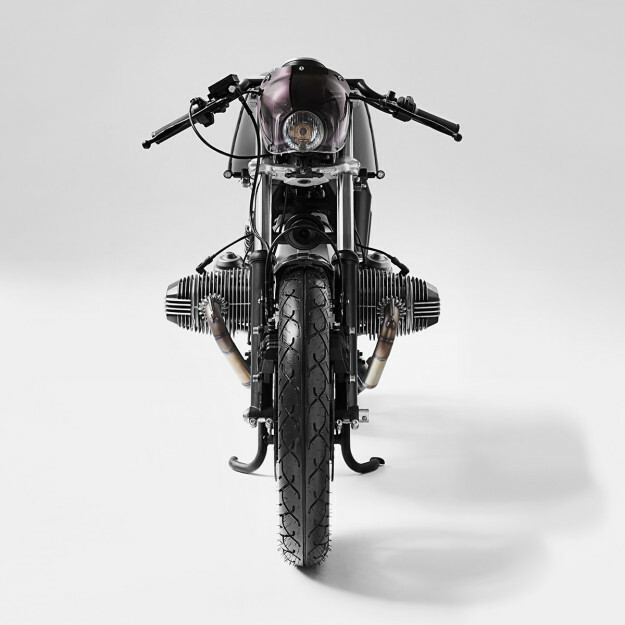 A petite tail unit and subframe were custom-made to complement it. 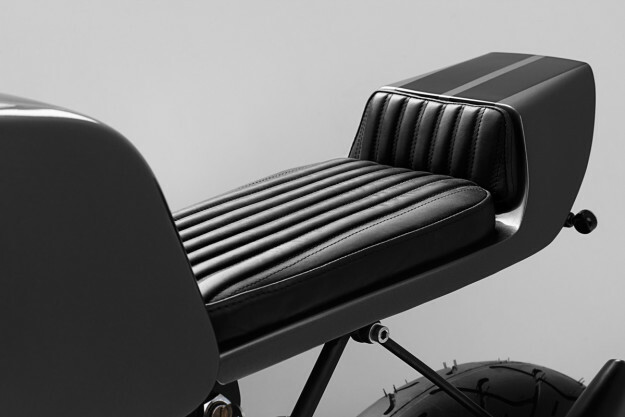 The new perch was been covered in leather, with a vintage race-bike stitching pattern. 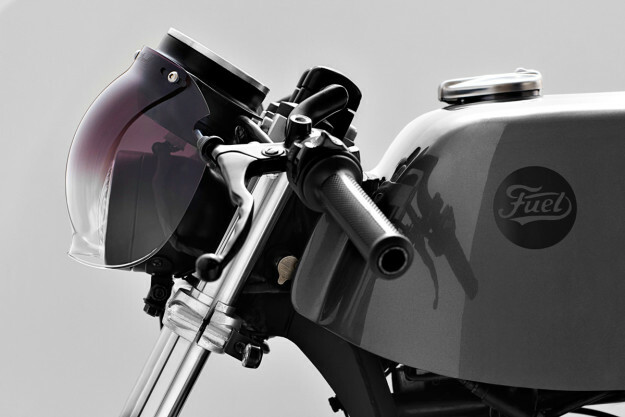 The unusual nose fairing up front is actually made from a Biltwell Inc. bubble visor. It’s mounted to a hand-made bracket that also houses the stock BMW tacho; the speedo has been discarded, to drive home the racing theme. Just underneath the tacho is a Motogadget push button that acts as the starter, and the ignition has been relocated to under the seat. Behind the bubble-fairing is a small but powerful headlight. The rear light is tucked away under the tail unit, along with a discreet license plate bracket, and tiny LED turn signals are mounted at both ends. 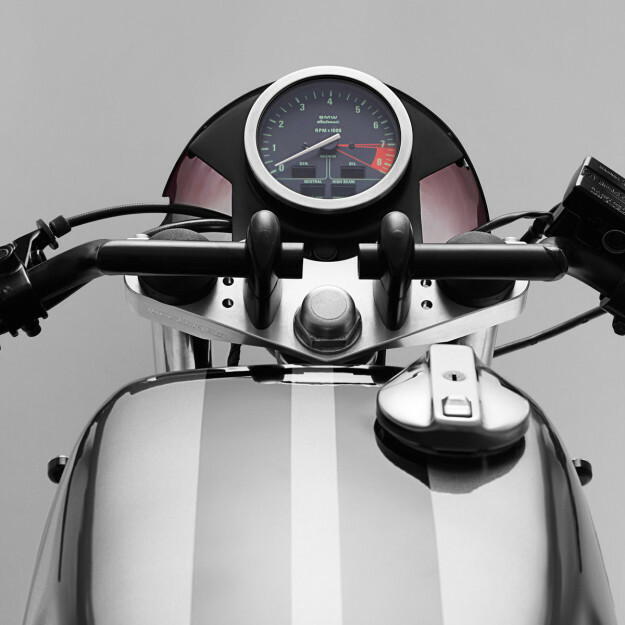 Matching the R65’s stretched-out ergonomics are rear sets and modified Ace-style bars. Fuel also made up a small front fender and an inner rear fender. That beautiful grey paint? It’s the same shade as the famous Gone in 60 Seconds Mustang, Eleanor. Everything else has been cleaned up or coated black. 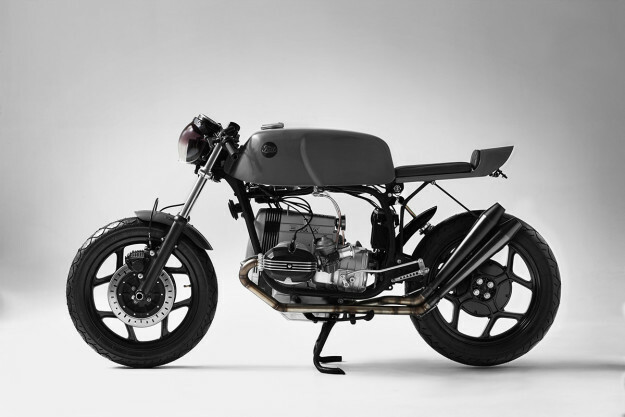 Fuel Motorcycles’ R65 has a lithe, graceful look that’s seldom seen on BMWs—but works beautifully. It might not be their usual bag, but it’s on par with the quality we’ve come to expect from them. Perhaps it’s time for Karles to start planning vintage track days in between those Scram trips.